The California native was a consensus All-American quarterback at the University of California, leading the nation his senior year with 182 completions for 2, 580 yards and 12 touchdowns. The No. 1 player selected in the 1975 NFL draft, Bartkowski played 11 seasons with the Atlanta Falcons before ending his career with Washington and the Los Angeles Rams. He retired in 1986. “Peachtree Bart” compiled outstanding individual records while Atlanta struggled mainly in mediocrity. In 1978, Bartkowski threw for a team-record 3,199 yards. In 1980, he passed for 31 TDs to lead the Falcons to its first divisional title. In 1981, he set a new record with 3, 830 yards, 22 TDs and just five interceptions. His career totals: a 56 percent completion rate (1, 931 for 3, 455), 24, 122 yards and 156 touchdowns. He Ranks Among the NFL’s Great QBs! His own talent, intelligence and perseverance enabled Steve Bartkowski to overcome numerous obstacles and emerge as one of the great quarterbacks in football history. The first pick in the entire NFL draft in 1975, the gifted quarterback went to the lowly Atlanta Falcons. He was surrounded by a weak supporting cast throughout much of his pro career, particularly a porous offensive line that was often unable to protect him from hard-hitting defensive linemen. Even when Atlanta’s overall offense improved, an ineffective defense held the team back from joining the NFL’s elite. But when Bartkowski walked away from the game just over a decade later, he held virtually every Atlanta passing record and had joined the ranks of the best quarterbacks to ever play the game. Steven went to the University of California after excelling in football and baseball at Buckser High School in Santa Clara. The Bay Area Rapid Transit (BART) was new at the time, and Cal fans coined the slogan: “Ride BART to the Rose Bowl!” The Golden Bears did not win the Pacific 8 title, but did go 7-3-1 in 1974, Bartkowski’s senior season. Steve led the nation in passing that year, completing 182 of 325 throws for 2,580 yards and 12 touchdowns. He was a consensus All-American, and finished 10th in the Heisman Trophy voting. 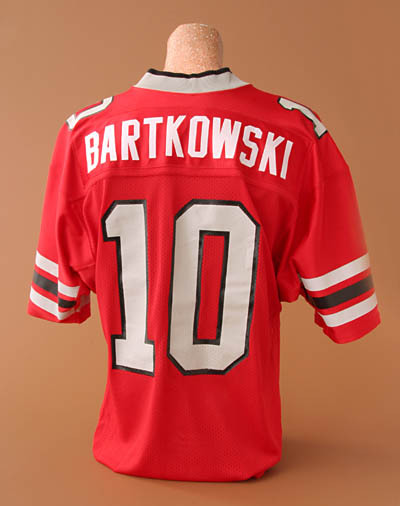 Many NFL teams coveted Bartkowski, who was blessed with all the tools needed to become a great pro quarterback: a strong arm, good size (6-foot-4-inches, 215 pounds), outstanding athletic ability, and keen intelligence. The Atlanta Falcons made a blockbuster trade with Baltimore to obtain the first selection in the draft so that they could acquire his rights. Atlanta needed plenty of help, having struggled since coming into the league in 1966. The quarterback position was a good place to start, especially with a talent like Bartkowski available. The problem was that, over the next decade, the Falcons were unable to assemble a strong supporting cast around him. “Peachtree Bart” started slowly, but eventually lived up to his promise. In 1978 he threw for a team-record 3,199 yards, leading the Falcons to a 9-7 record and its first playoff berth in team history. In 1980 Steve passed for 31 touchdowns while leading Atlanta to a 12-4 record, good for the franchise’s first divisional title. Bartkowski had an excellent game in the 1980 divisional playoff against Dallas, throwing for 320 yards and two touchdowns. The Falcons were betrayed by their defense, however, which allowed two fourth-quarter touchdown passes from Danny White to Drew Pearson. The late scores gave the Cowboys a 30-27 victory. Bartkowski had another outstanding season in 1981. He broke his own team passing yardage record, throwing for 3,830 yards (including a single game mark of 416 yards) and 24 touchdowns. Unfortunately, the Falcons’ mediocre defense helped keep the team’s record at just 7-9. In 1983 Steve was the top-rated passer in the entire NFL, completing 274 of 432 passes for 3,167 yards, 22 touchdowns and just 5 interceptions. His percentage of interceptions, 1.16, was the second lowest in league history. But while Atlanta scored 370 points, it allowed 389 and again finished with a 7-9 record. In 1984 Bartkowski completed 181 of 269 passes before being knocked out by a knee injury in mid-November. His completion rate that year of 67.29 percent was the third best in league history – only Sammy Baugh and Kenny Anderson have done better. But the pounding that his body had taken over the years had finally caught up with Bartkowski, especially his knees. In 1985 he suffered another knee injury five weeks into the season, and David Archer took over the quarterback position. Bartkowski went to the Washington Redskins and then the Los Angeles Rams in 1986, before finally calling it quits. He ended his NFL career with 24,124 yards passing and 156 TDs. He still holds a variety of Atlanta passing records, including career passing yards (23,468) and career passing touchdowns (154). He is widely considered the greatest player in franchise history. In addition to football, Bartkowski was an outstanding amateur baseball player. In college he played catcher and first base, and at one point announced that he was giving up football to concentrate on baseball. Eventually Steve was convinced to change his mind by University of California Head Football Coach Mike White. Steve also enjoys hunting and fishing, and hosted an outdoors show on ESPN. Steve Bartkowski was one of several “Polish Rifles” that played in the NFL in the 70s and 80s with varying degrees of success. They include Ron Jaworski, Mike Boryla, Mike Kruczek, Steve Pisarkiewicz, Joe Piscarcik, Sandy Osiecki and Mike Moroski (who backed up Bartkowski for a time). That tradition started years earlier with great quarterbacks like Johnny Lujack and Ed Danowski, and continued with players like Mike Tomczak and Don Majkowski. Chosen first in the 1975 draft, Bartkowski was the third Polish-American in four years to be the NFL’s number one pick. Defensive linemen Walt Patulski and John Matuszak were the first players selected in the 1972 and 1973 drafts, respectively. New York City has Broadway, and Atlanta has Peachtree Street. The Jets had “Broadway Joe,” and Falcons had “Peachtree Bart.” Like Joe Namath, Steve Bartkowski was a handsome, high profile quarterback known for a glamorous, swinging lifestyle. After a few years of trying to live up to that image, Bartkowski decided to concentrate more on football and improved his game tremendously.